Offers easy-to-find and relatable strategies that parents can use with their children to help with organization, time management and planning skills. All strategies are manageable and it is easy to see the immediate value in these strategies, which increases the chances of follow-through. The author offers personal examples of struggles and frustrations that makes the book very relatable. 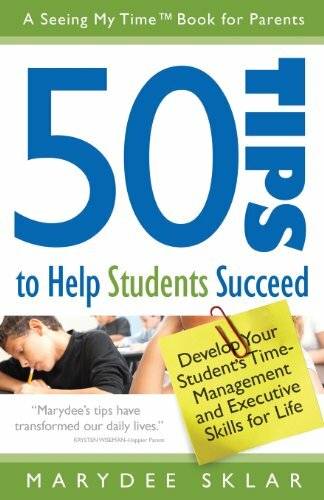 50 Tips to Help Students Succeed is an easy-to-read reference for parents of students in late elementary through high school who need support with executive function skills including time management, organization and planning. The author, a mom with her own executive function weaknesses, puts the challenges in perspective and helps parents recognize the importance of compassion, an understanding that skills can improve, and that parents often will need to adapt the home environment to help children succeed. The strategies are well-organized into short chapters, including homework, procrastination, challenging chores and handling distractions. Each strategy is manageable and in many cases provides an effective, novel approach (e.g. wear a watch, create "homes" for your child's belongings, or keep visual timers around the house). Advice is specific and practical and includes suggestions for how to implement the strategies for optimal success. For example, in the case of watches, the suggestion is to buy the watch with your child since this is a very personal choice. Additionally, the book offers good, basic explanations of the neuroscience of executive function skills and can serve as an ongoing reference that includes space for taking notes and having a plan. At last! Practical advice to help your child's success at school and at home. In this simple, easy-to-understand guide, Marydee Sklar explains how brain development is to blame for children's poor time-management, planning, and organization behaviors. You'll find solutions to day-to-day challenges so you can: - Overcome resistance to starting homework and projects - Let go of micromanaging your child's use of time - Ensure assignments are transported safely to and from school - Manage time spent on smartphones and video games - Forget nagging about chores and homework Written with compassion, Marydee's tips will enable the whole family to calm down and get work done. As an educator, Marydee Sklar has helped families struggling with time management for almost twenty years. She is the author of the Seeing My Time books.